... well maybe not! I'm guessing that you probably have your own traditions at this time of year, right? When it comes to Christmas Eve, I usually work. This year, things are different and not necessarily in a good way either. DH & I went food shopping yesterday and as expected, the supermarket was HEAVING with people buying enough food (& drink) to last for months!!! Anybody would think the shops were closed for the entire week, when in fact my local supermarket is open again on Boxing Day!!! 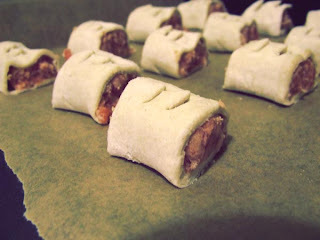 Anyhoo, one of the food traditions for my family at this time of year is sausage rolls ... you know the little bite-size ones? DH can quite happily munch his way through far too many of them in one sitting. LOL! So imagine his despair when we found out that the supermarket had SOLD OUT ... argghhhhh. "But fear not" said DH, "we can just make our own!". Now, baking cakes is something I'm quite good at (even if I do say so myself), but making pastry??? That's a whole different ball game. 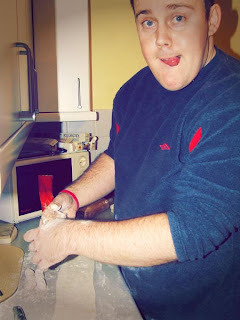 So the gauntlet was thrown down and DH took it upon himself to have a go at making his own sausage rolls this year. Gotta love that tongue sticking out ... I swear that pretty much every photo I took, he was sticking his tongue out whilst "concentrating". And here are the pre-baked results ... not bad for a 1st attempt! I think we may have found our new Christmas Eve tradition.